1956 Butterick #7785 vintage sewing pattern, misses' deep scooped neckline dress, size 16. For a variety of occasions: a scoop necked dress with an Empire cummerbund. 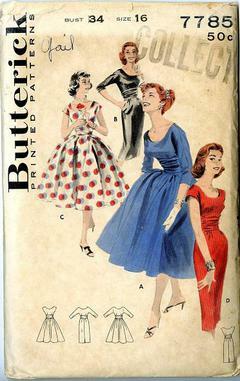 A. below-elbow length sleeves, full skirt. B. sheath version. C. full skirted view with just a hint of sleeves. D. brief sleeved sheath.